This ingenious blend of tradition and innovation is perfectly executed by the team at Gibson Memphis. 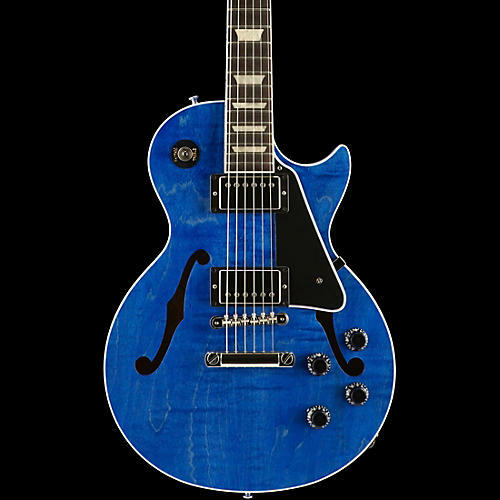 Combining characteristics of a Les Paul and ES-335 it yields surprisingly powerful tones and a wonderful playing experience, courtesy of PAF-style MHS Alnico II (lead) and MHS Alnico III (rhythm) pickups, rounded C neck profile, historic details and more. Other features include F-hole emblem engraved truss rod cover, redesigned neck dimensions, bone nut, rolled neck binding, low-profile frets, Kluson tuners and an ABR-1 bridge with stopbar tailpiece.